Crafting Adventures: I ♥ Kenny K! Lots of things seemed to happen whilst I had my little break. There were new paper companies, new embellies and new stamp releases. However, in my eyes, the most exciting development has to be the arrival of the Kenny K images. Oh. My. Lordy. I absolutely love these babies! I can see myself being exceptionally poor soon! Stamp, Scrap & Doodle Saturdays - Digi Stamps. Stamps: 'Queens Cutie' by Kenny K.
Paper: MME Quite Contrary - available HERE from DTDF. Copic Markers: E00, E11, E29, E31, E33, E35, E37, E50, R02, R81, R83, R85, YG03, YG63, YG67, BG15, BG23, BG49, W1, W3, W5, W7 - available HERE from DTDF. Tools & Embellishments: Buttons and pearls from stash. Thanks for stopping by today - hope you have a fantastic weekend! Ooooh, I am LOVING the new blog look missy and you are filling it with absolutely STUNNING creations!! Yey!! Stacey is blogging again - yippee!!! Love this card hun, that image is awesome and you have coloured it perfectly - damn you and your colouring skills!! Those are some of my fave papers at the mo too and you have used them beautifully - awesome creation! Wowww a wonderfull card Stacey! And indeed an adorable image! You have done a fabulous job coloring the Cutie and with the sketch Stacey!! Love it!! BTW if you like these images wait until the new release on the 1st! You are gonna flip!!LOL! Stunning card! Love how you colored her in and the colors you chose to use. A fab card Stacey, love the image and how colourful it is. Nice to see you back. Stacey this is AWESOME and I SOOOO love these images too..Your colors are fabulous and I love how she just pops off your creation!! AWESOME work! Love those papers!! The squares are so cute too!! This is gorgeous...Thanks for joining us this week for "Anything Goes" at PaperPlay. Another fab card hun!! Those papers are gorgeous! It's soooo good to see you back! This is such a great card Stacey! The image looks like it is coming right off the card! I understand your excitment (and worry about being poor). 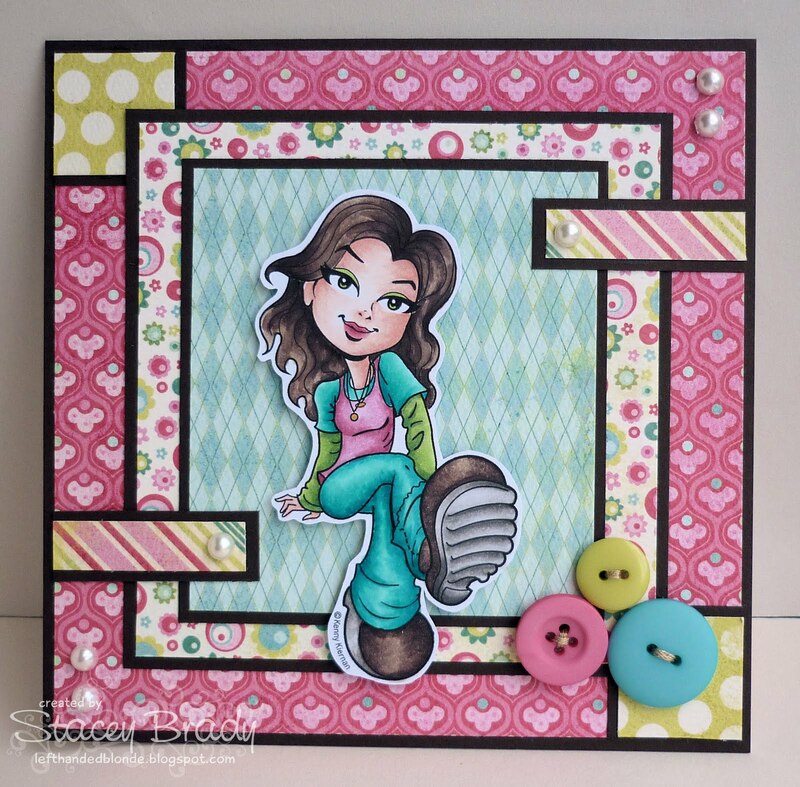 I've literally just made my first Kenny K card and posted on my blog and decided to come and look for more inspiration - I'm glad I found yours and came to have a closer look.